Show your state pride the best possible way with Mississippi State Flags from Tuff Flags. 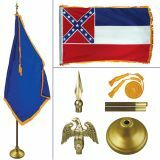 Available in two fabric choices of superior quality nylon and 2 ply polyester, our state flags come in all popular sizes. 100% made in USA, our flags are commercial grade and carry 6 months guarantee on construction. Choose from indoor flags, outdoor flags and indoor flag kit. 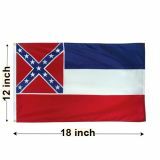 Shop from our complete line of Mississippi Flags right away and avail the best prices, quick shipping and much more! 100% customer satisfaction guaranteed! Our Mississippi State flags are unsurpassed in quality and authenticity. Offered in 200 Denier nylon and 2 Ply polyester fabrics, these state flags are finished with heading and grommets and feature colorfast Dupont inks, which will look brilliant and colorful for a very long time. Be it as gifts, collectibles of as display items, our flags will make perfect symbols of beauty and precision. Our Mississippi Flags are offered in several popular sizes including 3’x5’,4’x6’,5’x8’,6’x10’and 8’x12’ to cater to all your flag flying needs.